Over the last four months, the U.S. stock market has turned ugly and the fear of an economic recession is in the air. There are a lot of recession predictions coming out in the financial media. I have seen forecasts for an economic slowdown this year, next year, or further out on the future. Timing of the next recession is for entertainment value only. However, since the economy does go through growth and recession cycles, you can be fairly positive that the economy will go through a period of negative growth at some time in the future. To get through an economic downturn, income stock investors want to own stocks that won’t cut their dividend rates when business conditions turn rough. The easy path is to go with Dividend Aristocrat types of stocks, but the trade-of for that level of safety is low yields, with this group currently averaging around 3%. Today I want to discuss a group of stocks that currently pay yields of 7% to 9% and have business models built to be successful through the full range of economic growth and contraction. Finance real estate investment trusts (REITs) are companies focused on the finance side of the real estate sector. 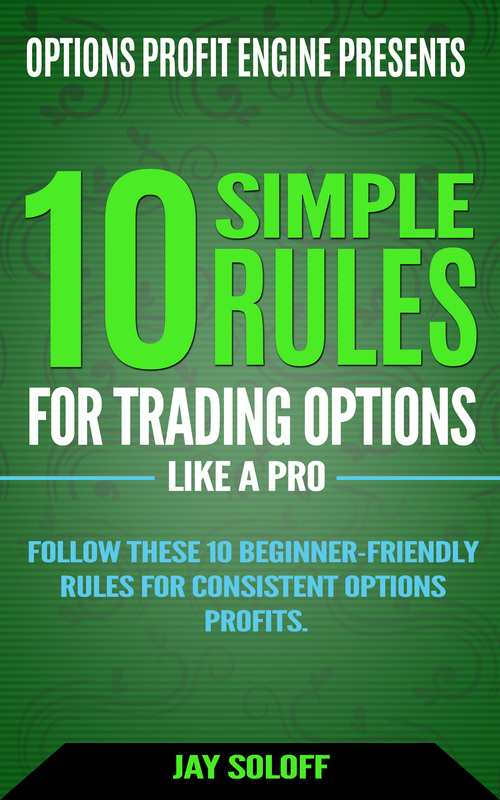 They originate or own mortgages, mortgage backed securities, or related investment securities. The finance REIT group can be further divided into those that focus on residential mortgages and those which are in the commercial property mortgage business. Interestingly, the former group are risky and a danger to your portfolio, while the commercial finance REITs provide a high level of dividend income safety. Here are the reasons why a commercial mortgage REIT stock tends to be a solid dividend income investment. Most commercial REITs are mortgage originators and keep the loans in their portfolio. This allows these companies to use less leverage to get attractive returns on capital. Most commercial mortgage loans have adjustable interest rates. A commercial REIT can match its borrowings to its loan portfolio and generate steady returns through both ups and downs in market interest rates. Commercial REITs lend at very conservative loan-to-value ratios. This means property owners will be highly motivated to keep making their mortgage payments if they want to protect their equity. If the REIT forecloses on a property, its likely the real estate can be flipped for an amount greater than the outstanding loan balance. Here are three commercial mortgage REITs that are well run, and the stocks carry attractive yields. 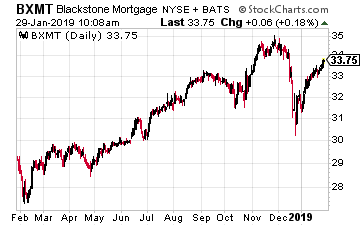 Blackstone Mortgage Trust (NYSE: BXMT) is a REIT that makes mortgage loans on commercial properties. They make loans up to $500 million on a single property, which puts them in a very small group of financial companies that will write very large loans on commercial properties. The commercial mortgages issued by Blackstone Mortgage are retained in the company’s $13.8 billion investment portfolio. This is a conservatively managed business, with an average loan-to-property value of 62% and 2.3 times debt to equity leverage. Income is the interest earned from the mortgage portfolio minus the cost of the debt. The portfolio is 95% floating rate loans, with debt rate matched to each loan. The result is that as interest rates increase, so will Blackstone’s profits. 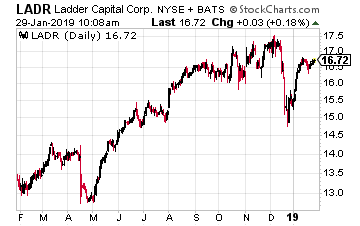 Ladder Capital Corp (NYSE: LADR) is the only commercial finance REIT listed here that is internally managed. Management also owns 12% of the stock. Ladder has a three prong investment strategy where it owns a portfolio of commercial loans, a portfolio of commercial mortgage backed securities, and it owns commercial real estate. The balance sheet loan portfolio accounts for 76% of the total assets. In contrast to BXMT, the average loan size for Ladder Capital is $20 million. Total company assets are $6.4 billion, which includes a $1.2 billion real estate equity portfolio. The $4.2 billion loan portfolio has a 68% loan-to-value. The current dividend is well covered, at just 66% of core EPS. 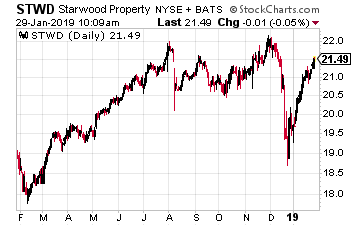 Starwood Property Trust (NYSE: STWD) is another commercial finance REIT. It originates mortgage loans for commercial properties, such as office buildings, hotels, and industrial buildings. Starwood has two commercial lending businesses. One is to make large dollar loans to retain in its portfolio. The company also operates a fee-based CMBS origination business. The $8.0 billion commercial loan portfolio has a 62% LTV. To further diversify the company has acquired a portfolio of stable returns real estate assets and has added an infrastructure lending arm. The final piece of the pie is a special servicing division, which will turn very profitable if the commercial real estate sector experiences a downturn. Large commercial loans account for 55% of net earnings. The diversified businesses bring in the balance. Investors can expect to earn the dividend, which currently gives the shares a 9.5% yield.